It's A Dan's World: RANDOM WORK OF WOW: Giorgio Comolo's M.O.D.O.K. RANDOM WORK OF WOW: Giorgio Comolo's M.O.D.O.K. Sometimes you stumble across a portfolio where the artist only has a couple of comic based pieces, other times there can be just one work so brilliant, you'd risk being stoned to death by fellow art lovers for putting something else beside it. These are Random Works of Wow, and illustrating the point this week is Giorgio Comolo and M.O.D.O.K. Hey, he's a big giant head in a floatation device (M.O.D.O.K. not Giorgio) - what about that doesn't scream 'Draw me!'? Amazingly by mixing more than a fair portion of H.R. 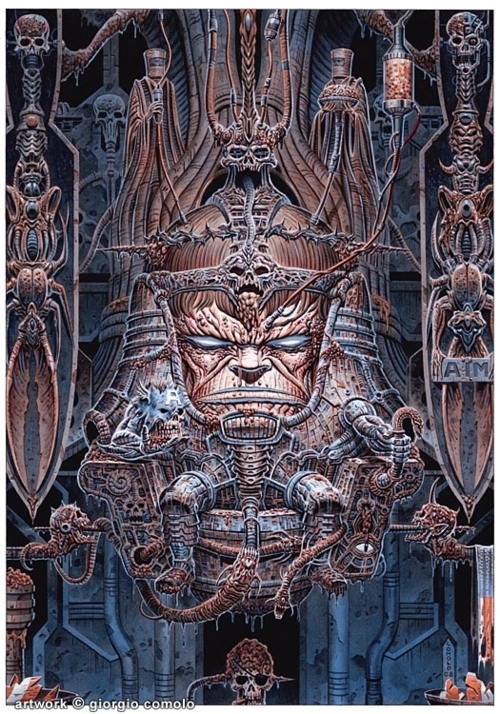 Giger's influence, Comolo creates a haunting image of Marvel's crankiest cranium! What do you think? After you've clicked to enlarge, sound off below or to view more of Giorgio's awesome artworks click the jump. For more Random Works of Wow, click here. Absolutely stunning...a true work of art. Reminds me of H.R Giger in many ways. Glad you liked it too Karl - thanks for the comments! Sweet God, that's the best MODOK's ever looked, besides those Marvel Legends shorts on youtube. Very cool to see him look like this, which kinda' makes you have to take him a little more seriously in this incarnation. Yeah I think that's the shocker Dale - you look at it and go 'Okay, big giant floating head no longer a laugh, actually pretty damn evil'.